That’s just naughty. Sounds like a good time, though! Whenever I’m chewing gum and pass a big blue PostOffice mail box, I’m tempted to drop my gum in. I love this post. 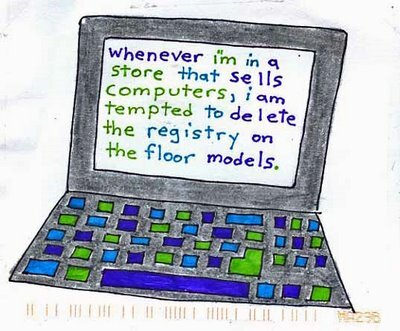 Most stores have no business selling computers. Here are some handy rules when you need a computer. 1. Ask around and find a person who really knows computers. 2. Buy that person lunch to discuss your needs. 3. Let them help you purchase what you really need, and work with you to get it set up correctly. 4. Avoid stores. Try to find a person who can sell it to you whom you can then contact if you need warranty service. Stores will never help you. That said I still really love this post. I want it on a T-shirt.